The flower girl is the sweetest little wedding guest. She will melt all the hearts with her innocent look walking down the aisle in the front of a bride. Picturing a little girl in her adorable flower girl dress stepping on the red carpet is one of our favorite parts of the bridal ceremony. She may be a tiny girl, but without a doubt, she is in the spotlight during the whole service, standing beside a bride. Sometimes finding the right flower girl dress to match the wedding gown, bridal party and wedding theme is not an easy task. If you haven’t started looking or are struggling to find the right flower girl dress for your wedding, here are some tips and advice to help you dress the littlest member of your bridal party. Let her feel good, stand out and enjoy this beautiful moment with you. Flower girl dresses come in a variety of styles and colors! Designers offer flower girl dresses in many different styles, silhouettes, and colors. While browsing the Papilio Kids collections, you will find many different designs and colors of flower girl dresses. Eventually, you will find the one that fits your bridal theme. When it comes to picking the perfect color for your flower girl, a mini version of your wedding dress or matching bridesmaids’ dresses are usually the best options you have. What is more adorable than a little girl looking just like the bride. For example, you can choose a stunning white, ivory or blush ball gown with a sash that matches the bridesmaids’ dresses. Not only will your bridal party look amazing in your wedding pictures, but it will also make your little girl’s dream of being a princess come true. Do not be afraid to go bold with the color of your flower girl’s dress! Blue is the color of calmness, freshness, and peace. Luxurious flower girl dresses in baby blue can be the perfect option for a beach or destination wedding. Green symbolizes balance and growth. It also promotes a love of nature. If you are a bohemian bride or getting married in a botanical garden, a green flower girl dress is an excellent choice for your flower girl. These are both are colors of sunshine, warmth, and happiness. A flowy coral, peach or orange dress can warm up your fall or winter wedding when you get your little girl to dress as the sunshine! That is the color of elegance, luxury, and quality. An absolutely eye-catching rose gold or glistening gold flower girl dress can add magic to your royal wedding theme. Purple is the color of spirituality and imagination. For example, a beautiful organza frock with extra touches of fantasy pale purple sash is a fairytale-like style for your dreamy, romantic wedding. No matter what kind of flower girl dress you pick, you want your little girl to feel 100% comfortable. The wedding should be an unforgettable day for everyone. That’s why you should keep in mind that no matter what style or color flower girl dress you choose, your flower girl should be entirely comfortable and excited to wear her dress for the whole day. Considering that flower girls are generally between the ages of three and eight, some styles look good better on younger girls whereas some are more age-appropriate for older girls. For example, a tea-length flower girl dress may be the best option for baby girls or toddlers. They will feel confident walking down the aisle in a shorter skirt. Longer flower girl dresses can be more suitable for girls of age five and up. Also, remember that young girls are growing fast! A tight fit isn’t a good idea especially if you are ordering a flower girl dress a year in advance. That’s why we recommend selecting at least one size up to let her move freely and feel happy. Besides, your choice of flower girl dress will be significantly influenced by the season you are getting married. A sunny, yellow short sleeve dress in chiffon or tulle can be perfect for a warm-weather wedding and make your little one comfortable in her flower girl dress. While for a cold-weather wedding, you can buy something with long sleeves or made of a heavier fabric like a fashionable velvet dress with a shimmery gold sash. Consider the quality, weight, and feel of the materials. Satin, organza, tulle or chiffon are top options for wedding dresses as well as for luxurious flower girl dresses. Each of these fabrics has different characteristics and its own appeal. 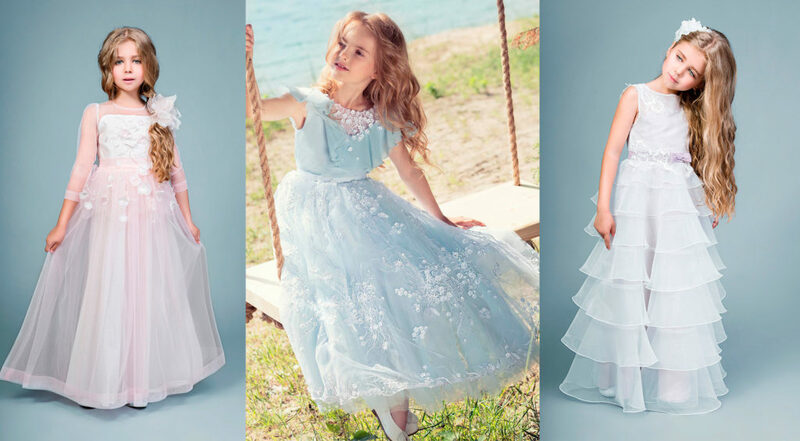 While incredibly lightweight, satin and organza dresses can create a smooth and glossy style whereas tulle and lace gowns with luxurious embellishments can bring your flower girl an airy feeling and a royal look. By choosing the proper silhouette and fabric, your little one will feel special and comfortable, and everything will go smoothly on your big day. At Papilio, we use luxurious fabrics such as lace, organza, and silk in combination with unique tailored designs to create luxury flower girl dresses. Whether you wish to dress your little guest in an ultra-feminine style, something pretty in pink, or, maybe, something with a bohemian touch, there are many beautiful designs. Get inspired and browse our collection of luxury flower girl dresses here. Ball gown with our signature 3D handmade flower decor and embroidery which will make your little one feel like a fairy. Organza layered gown with lace decor is perfect for flower girls, featuring a stunning white lace bodice. A-line tulle dress with ¾ length illusion sleeves in a gorgeous shade of blush.